Swipe HALO FONE is the latest offering from Swipe Telecom in there phablet series. It comes with entry level specifications but at very affordable price, considering its value. The new HALO FONE looks very similar to HTC Smartphones, especially from the front. 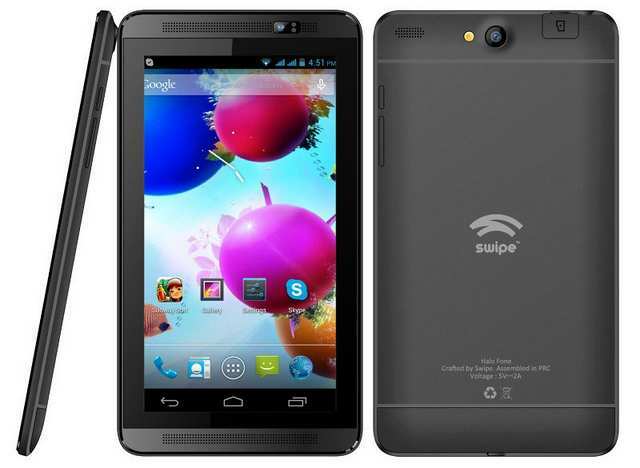 It features 6.5 inch 800 x 480 pixels WVGA capacitive touch screen, dual Core CPU, 2-megapixel shooter and Android 4.2 OS. It has DUAL SIM card slots with and 3G connectivity for fast internet. It houses 2800 mAH battery which would make you despondent. It offers 3G, WiFi b/g/n, BT, GPS, 3.5 mm audio jack and micro USB connectivity. The phablet is low on RAM, but you can’t expect more at this price tag. Overall it seems to be good for beginners, who have not tasted the Android yet. The Swipe Halo Fone is priced at INR 7000 and it will be available in BLACK color. The Zync Z605 would be its main Rival.